What are other types and causes of anemia? How does blood loss cause anemia? What is a complete blood cell (CBC) count? How is blood collected for a CBC? What is the red blood cell (RBC) count? What are the complications of anemia? What is the prognosis for a person with anemia? Anemia is a medical condition in which the red blood cell count or hemoglobin is less than normal. Anemia is caused by either a decrease in production of red blood cells or hemoglobin, or an increase in loss (usually due to bleeding) or destruction of red blood cells. Anemia can be detected with a simple blood test called a complete blood cell count (CBC). The treatment of the anemia varies greatly and very much depends on the particular cause. Anemia is a medical condition in which the red blood cell count or hemoglobin is less than normal. The normal level of hemoglobin is generally different in males and females. For men, a normal hemoglobin level is typically defined as a level of more than 13.5 gram/100 ml, and in women as hemoglobin of more than 12.0 gram/100 ml. These definitions may vary slightly depending on the source and the laboratory reference used. It is worth noting that if anemia is longstanding (chronic anemia), the body may adjust to low oxygen levels and the individual may not feel different unless the anemia becomes severe. 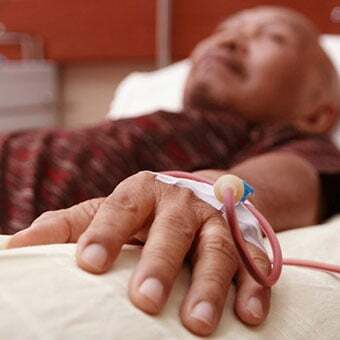 On the other hand, if the anemia occurs rapidly (acute anemia), the patient may experience significant symptoms relatively quickly, and even with relative mild fluctuations of hemoglobin levels. Any process that can disrupt the normal life span of a red blood cell may cause anemia. Normal life span of a red blood cell is typically around 120 days. Red blood cells are made in the bone marrow. an increase in loss or destruction of red blood cells. A more common classification of anemia (low hemoglobin) is based on the Mean Corpuscular Volume (MCV) which signifies the average volume of individual red blood cells. If the MCV is low (less than 80), the anemia is categorized as microcytic anemia (low cell volume). If the MCV is in the normal range (80-100), it is called a normocytic anemia (normal cell volume). If the MCV is high, then it is called a macrocytic anemia (large cell volume). Looking at each of the components of a complete blood count (CBC), especially the MCV, a physician can gather clues as to what could be the most common reason for anemia in each patient. Iron deficiency is a very common cause of anemia. This is because iron is major component of hemoglobin and essential for its proper function. Chronic blood loss due to any reason is the main cause of low iron level in the body as it depletes the body's iron stores to compensate for the ongoing loss of iron. Anemia that is due to low iron levels is called iron deficiency anemia. Young women are likely to have low grade iron deficiency anemia because of the loss of blood each month through normal menstruation. This is generally without any major symptoms as the blood loss is relatively small and temporary. Another common reason for iron deficiency anemia can be due to recurring or small ongoing bleeding, for instance from colon cancer or from stomach ulcers. Stomach ulcer bleeding may be induced by medications, even very common over-the-counter drugs such as aspirin and ibuprofen (Advil, Motrin). Slow and chronic oozing from these ulcers can lead to loss of iron. Crohn’s disease can lead to iron deficiency anemia. In infants and young children, iron deficiency anemia is most often due to a diet lacking iron. Interpretation of a complete blood count test (CBC) may lead to clues to suggest this type of anemia. For instance, iron deficiency anemia usually presents with low mean corpuscular volume (microcytic anemia) in addition to low hemoglobin. Aplastic anemia is a life-threatening form of complete bone marrow failure. As a result, the blood contains inadequate numbers of red blood cells (anemia) as well as insufficient white blood cells (leukopenia) and platelets (thrombocytopenia). 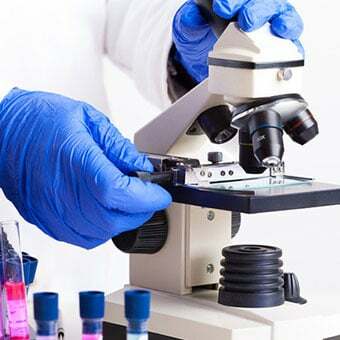 Complete bone marrow failure causes all three cell lines produced in the bone marrow to be inadequate, a condition referred to as pancytopenia. Aplastic anemia can occur at nearly any age. Its onset can be sudden or gradual. 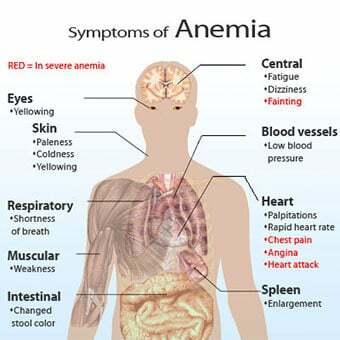 The symptoms of this anemia are similar to the symptoms of all anemias ( see above ) as well as recurrent infections and abnormal bleeding. medications (for examples, chloramhenicol, carbamazepine, and phenytoin);. Vitamin B12 deficiency may cause pernicious anemia. This type of anemia could happen in people who are unable to absorb vitamin B12 from their intestines due to a number of reasons. Strict vegetarians are at risk if they do not take adequate vitamin supplements. People who have abnormal structure or function of the stomach or intestines leading to impaired B12 absorption despite adequate intake. This typically causes macrocytic (large blood cell volume) anemia. 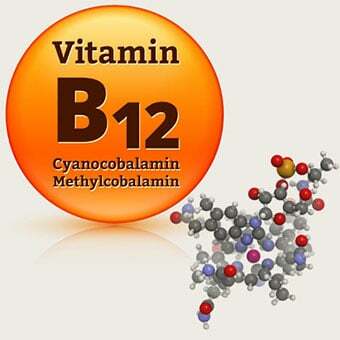 Vitamin B12, along with folate, is involved in making the heme molecule that is an integral part of hemoglobin. Folate deficiency can be the culprit of anemia as well. This may also be caused by inadequate absorption, under-consumption of green, leafy vegetables, and also long-term heavy alcohol use. There can be rupture or destruction of red blood cells (hemolytic anemia) due to antibodies clinging to the surface of the red cells. 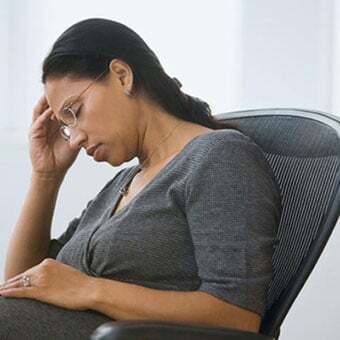 Examples of hemolytic anemia include hemolytic disease of the newborn, medication induced hemolytic anemia, transfusion related hemolysis, and autoimmune hemolytic anemia. A wide assortment of bone marrow diseases can cause anemia. For example, cancers that spread (metastasize) to the bone marrow, or cancers of the bone marrow (such as leukemia or multiple myeloma) can cause the bone marrow to produce red blood cells inadequately, resulting in anemia. Certain chemotherapy for cancers can also cause damage to the bone marrow and decrease red blood cell production, resulting in anemia. Finally, patients with kidney failure may lack a hormone necessary to stimulate normal red blood cell production by the bone marrow. Chronic alcohol consumption may lead to anemia via different pathways and thus, anemia is commonly seen in alcoholics. Another common cause of anemia is called anemia of chronic disease. This could typically occur in individuals with longstanding chronic diseases. Some medications can cause anemia in a variety of ways. Human immunodeficiency virus (HIV) and acquired immune deficiency syndrome (AIDS) can cause anemia. Yes, anemia may be genetic. 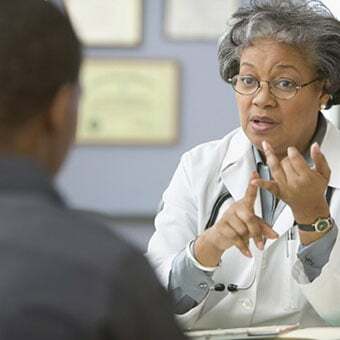 Hereditary disorders create abnormal hemoglobin and can shorten the life span of the red blood cell and lead to anemia (for example, sickle cell anemia). Hereditary disorders can also cause anemia by impairing the production of normal hemoglobin (for example, alpha thalassemia and beta thalassemia). Depending on the degree of the genetic abnormality, hereditary anemias may cause mild, moderate, or severe anemia. In fact, some may be too severe to be compatible with life and may result in death of the fetus (unborn infant). On the other hand, some of these anemias are so mild that they are not noticeable and are incidentally revealed during routine blood work. Anemia is usually detected, or at least confirmed, by a complete blood cell (CBC) count. 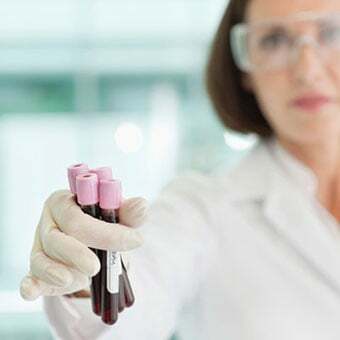 A CBC test may be ordered by a physician as a part of routine general checkup and screening or based on clinical signs and symptoms that may suggest anemia or other blood abnormalities. Only the first three of these tests -- the red blood cell (RBC) count, the hematocrit, and the hemoglobin -- are relevant to the diagnosis of anemia. Additionally, mean corpuscular volume (MCV) is also often reported in a CBC, which basically measures the average volume of red blood cells in a blood sample. This is important in distinguishing the causes of anemia. Units of MCV are reported in femtoliters, a fraction of one millionth of a liter. Other useful clues to causes of anemia that are reported in a CBC are the size, shape, and color of red blood cells. 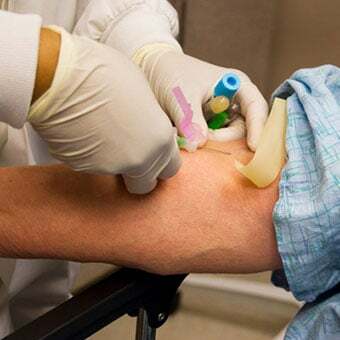 Blood is collected by venipuncture (using a needle to draw blood from a vein) in a lab, hospital, or physician's office. Typically, blood is collected in a special sterile tube from an arm vein. The tube has some preservatives to prevent clotting of the blood. Results may be available in an hour or longer depending on the setting. 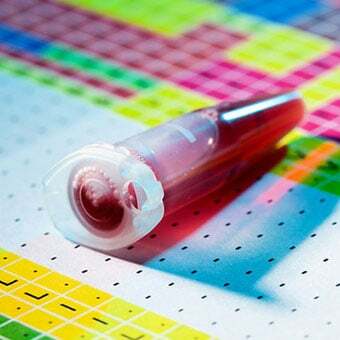 In some instances, a quick in office test called hemoglobin rapid test may be performed using a few drops of blood from a finger prick. The advantage of this quick test is that results may be obtained in a few minutes and only a few drops of blood may be required. The red blood cells (RBCs or erythrocytes) are the most common type of cells in the blood. We each have millions and millions of these little disc-shaped cells. The RBC count is done to determine if the number of red blood cells is low (anemia) or high (polycythemia). In an RBC count, the number and size of the RBCs are determined. This is usually reported as number of RBCs per a specified volume, typically in millions of RBCs in microliters (one one-thousandth of an ml) of whole blood. The shape of the RBCs is also evaluated under a microscope. 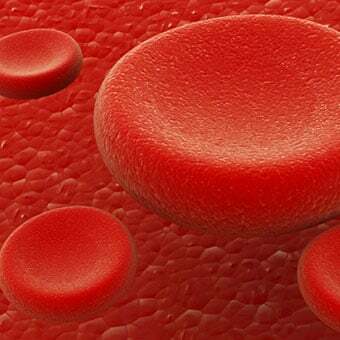 All of this information, the number, size and shape of the RBCs, is useful in the diagnosis of anemia. Further, the specific type of anemia may be determined by this information. 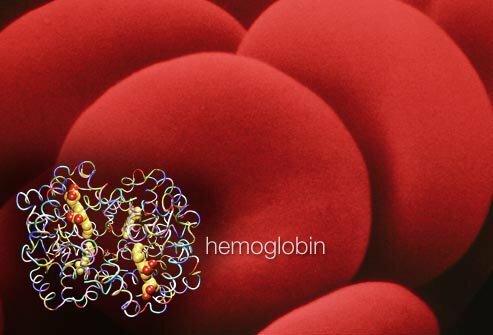 Hemoglobin is a red pigment that imparts the familiar red color to red blood cells and to blood. Functionally, hemoglobin is the key chemical compound that combines with oxygen from the lungs and carries the oxygen from the lungs to cells throughout the body. Oxygen is essential for all cells in the body to produce energy. The blood also transports carbon dioxide, which is the waste product of this energy production process, back to the lungs from which it is exhaled into the air. The transport of the carbon dioxide back to the lung is also achieved by hemoglobin. The carbon dioxide bound to hemoglobin is unloaded in the lungs in exchange for oxygen to be transported to the tissues of the body. The hematocrit is specifically a measure of how much of the blood is made of red cells. The hematocrit is a very convenient way to determine whether the red blood cell count is too high, too low, or normal. The hematocrit is a measure of the proportion of blood that is composed of the red blood cells. 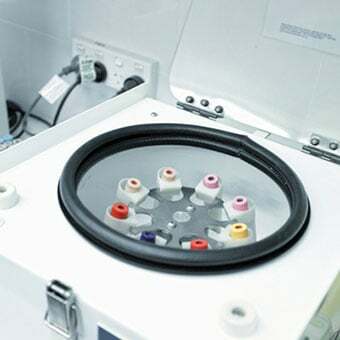 The red blood cells in the sample of blood can quickly be determined by spinning a tube of blood in a centrifuge under prescribed conditions. The proportion of the tube that consists of red blood cells is then measured. Let's say that it is 45%. The hematocrit is 45%. The treatment of the anemia varies greatly. First, the underlying cause of the anemia needs to be identified and corrected. For example, anemia as a result of blood loss from a stomach ulcer should begin with medications to heal the ulcer. Likewise, surgery is often necessary to remove a colon cancer that is causing chronic blood loss and anemia. 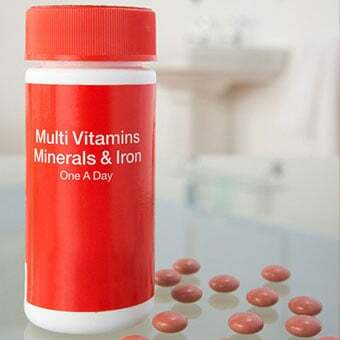 Sometimes iron supplements will also be needed to correct iron deficiency. In severe anemia, blood transfusions may be necessary. Vitamin B12 injections will be necessary for patients suffering from pernicious anemia or other causes of B12 deficiency. In certain patients with bone marrow disease (or bone marrow damage from chemotherapy) or patients with kidney failure, epoetin alfa (Procrit, Epogen) may be used to stimulate bone marrow red blood cell production. If a medication is thought to be the culprit, then it should be discontinued under the direction of the prescribing doctor. 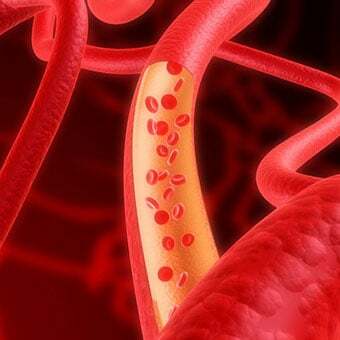 As mentioned earlier, hemoglobin has the important role of delivering oxygen to all parts of the body for consumption and carries back carbon dioxide back to the lung to exhale it out of the body. If the hemoglobin level is too low, this process may be impaired, resulting in low levels of oxygen in the body (hypoxia). Anemia generally has a very good prognosis and it may be curable in many instances. The overall prognosis depends on the underlying cause of anemia, its severity, and the overall health of the patient. Maakaron, Joseph E. "Anemia." Medscape. Oct. 8, 2018. 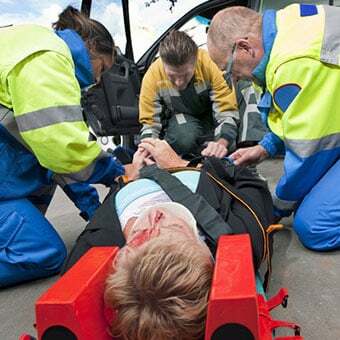 <http://emedicine.medscape.com/article/198475-overview>.